Stay tuned for upcoming events for Musical Evening with Tina Sani in near future. Tina Sani will perform live on 19th November 2017 at Alhamra Arts Council in Lahore. This performance is part of the Faiz International Festival 2017. 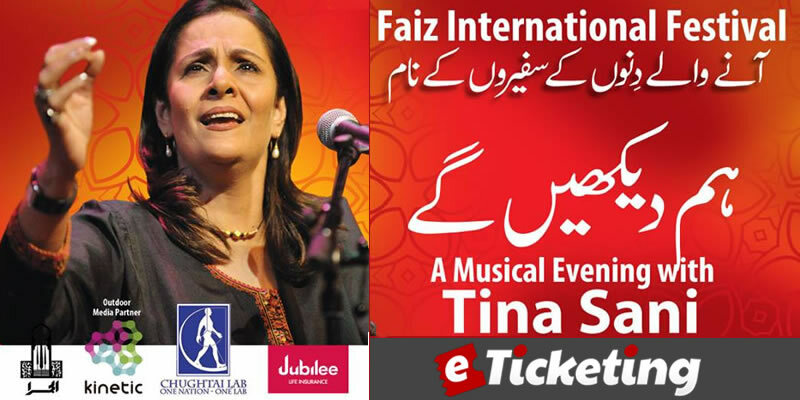 People in Lahore and nearby cities enjoy Musical Evening with Tina Sani. Tina Sani is a popular female singer from Pakistan. She sings in the genres of	Classical music and Ghazals. She is known for establishing her own style of singing. She earned praise for singing the poetry of Faiz Ahmed Faiz, Ghalib, Zauq, Mir Taqi Mir and Iqbal. Best Viewed at 1024 x 768 pixels and above. This Page loaded in 0.02554 seconds on Tue, Apr 23, 2019 (20:57).